Residents of the Falkland Islands voted almost unanimously to stay under British rule in a referendum aimed at winning global sympathy as Argentina intensifies its sovereignty claim. The official count showed 99.8 per cent of islanders voted in favor of remaining a British Overseas Territory in the two-day referendum, which was rejected by Argentina as a meaningless publicity stunt. Only three “no” votes were cast. Pro-British feeling is running high in the barren and blustery islands that lie off the tip of Patagonia, and turnout was 92 per cent among the 1,649 Falklands-born and long-term residents registered to vote. Three decades since Argentina and Britain went to war over the far-flung South Atlantic archipelago, residents have been perturbed by Argentina’s increasingly vocal claim over the Malvinas – as the islands are called in Spanish. “I think it would be quite appropriate to recall the positive experience of past decades when the so-called GTO, Ready for Labor and Defense, was in use in our country,” he said. The GTO physical training program was introduced under Joseph Stalin in 1931 to prepare youth for service in the Red Army. Under the program, school and university students were required to pass the physical tests, and those who qualified would receive silver or gold badges. The GTO program ceased to exist when the Soviet Union collapsed in 1991. Putin, 60, has a reputation as a martial artist, outdoorsman and adventurer, frequently appearing in publicity photos participating in extreme sports and tranquilizing wild animals. Part of his popularity is rooted in nostalgia for Soviet-era law and order, and he remains Russia’s most popular politician despite widespread protest and opposition. Russian Sports Minister Vitaly Mutko told a government meeting chaired by Putin that his agency would work to introduce the physical training standards nationwide by 2016. Workers digging a new railway line in London have uncovered what they believe is a burial ground containing victims of the Black Death – a plague that wiped out as much as half of London’s inhabitants when it swept the city in the mid-14th century. At a time long before people moved quickly, the plague traveled fast. The bacillus spread via fleas on rats, cutting a swathe through populations ignorant of its cause. It began racing from Asia through Europe and North Africa in 1347, moving quickly among people who had no idea how to stop it. By 1348 it struck Great Britain. While estimates vary, it is thought to have killed roughly 75 million people worldwide in a four-year pandemic. Among the millions killed were thousands of Londoners, though the exact number is unclear because record-keeping was so poor, said Roy Stephenson, the head of the Museum of London’s archaeological collections and archives. Still there was order in the Charterhouse site, and the regular spacing between the bodies suggests some sort of municipal control, Stephenson said. Scientists have brought the remains to the Museum of London Archaeology for laboratory testing, hoping to map the DNA signature of the bacteria, which could be found in the teeth or bones. Radiocarbon dating could also be used to establish burial dates. But there’s no chance that a new outbreak of bubonic plague might be ignited from the find. Stephenson said the bacillus is quite fragile and dies without a host. –The population of the Falkland Islands, estimated at 2,841, primarily consists of native Falkland Islanders, the vast majority being of British descent. Other ethnicities include French, Gibraltarian, and Scandinavian. Immigration from the United Kingdom, Saint Helena, and Chile has reversed a former population decline. The predominant and official language is English. Under the British Nationality Act of 1983, Falkland Islanders are legally British citizens. –Argentine President Cristina Kirchner argues that because the Falkland Islands are located much closer to the coast of Argentina than they are to the coast of the British Isles they should therefore be Argentinian. George Grant of London’s Daily Telegraph says that makes as much sense as forcing Alaska to become a part of Canada because it is separated from the rest of the U.S. by some 500 miles and connected to Canada by a border more than 1,500 miles long. –99.8% of Falkland Islanders voted in favor of remaining a British Overseas Territory. What do you think? 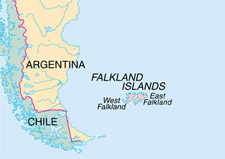 Should President Kirchner of Argentina give up this quest to take control of the Falkland Islands? b) Why does President Putin say Russia’s young people need to be fit? c) What do you think about any governments’ (U.S., Russia, etc.) push to promote physical fitness among young people? (great idea, scary, necessary, unnecessary…) Explain your answer. b) During what years did the Black Death spread from Asia to Europe and North Africa? c) How much of London’s population was killed by the Black Death? d) How many people were killed overall by the this plague? e) Why isn’t the exact number known? NOTE: The area now known as Argentina was relatively sparsely populated until the period of European colonization. The Spanish established more permanent colonies it in the late 1500s. The Black Death is thought to have started in China or central Asia. It then travelled along the Silk Road and reached the Crimea by 1346. From there, it was probably carried by Oriental rat fleas living on the black rats that were regular passengers on merchant ships. Spreading throughout the Mediterranean and Europe, the Black Death is estimated to have killed 30 to 60 percent of Europe’s population. All in all, the plague reduced the world population from an estimated 450 million to a number between 350 and 375 million in the 14th century. The aftermath of the plague created a series of religious, social and economic upheavals, which had profound effects on the course of European history. FALKLAND ISLANDS: Read about the various claims to the Falklands at wikipedia.